acrobalance | Roping Towards a Ph.D. I planned to visit an old friend in Gothenburg, Sweden after the viva. It was meant to be a celebration trip, so I hesitated whether I should still go away on holiday after the disappointing result of major corrections. In the end I decided to go because I hadn’t seen my friend in a long time, and I needed something to distract me from being depressed. I had my viva on a Monday, so pretty much cried throughout the week and couldn’t leave the flat until Sunday. The weather was incredibly sunny that day, the whole city was alive with the amount of people that came to enjoy the seafront. I half cried through my lunch as I felt I couldn’t join in the season of summer festivities. I managed to decide to go to Gothenburg anyway where my friend Fabiana lives. I had a great time, and the trip dispelled the viva blues… Until I came back at least. 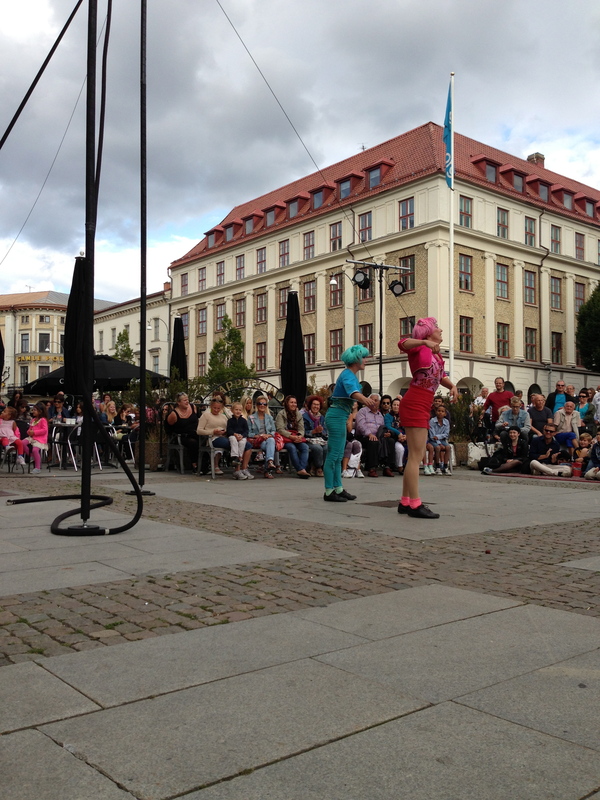 One of the nicest surprises was to see a free street circus show. I only found out that I caught the annual culture festival in Gothenburg, and a number of events were free to the public. 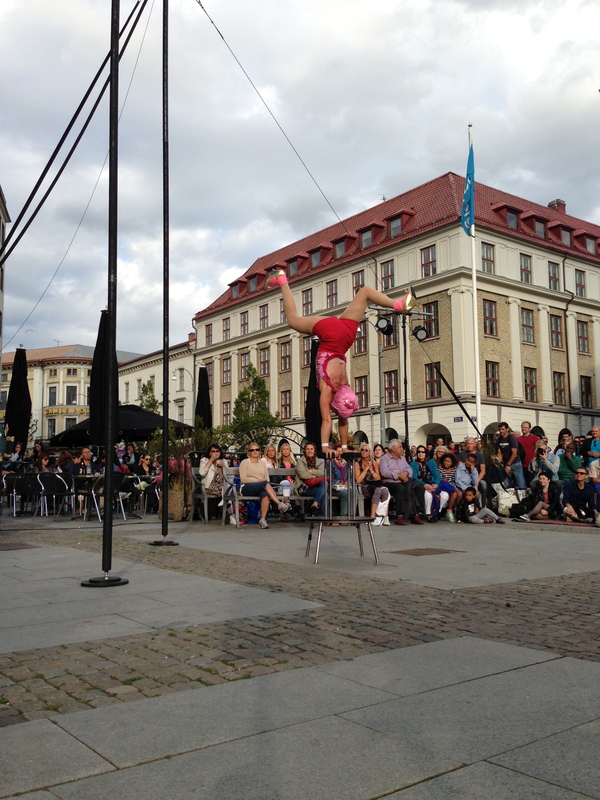 We were on our way to Haga, an area similar to London’s Soho in vibe, when we caught glimpse of the performance from afar. It was the last ten minutes of that performance, but we checked the time schedule on the board and were lucky to find that they were performing again at 6pm. Doubles on the cloud swing. It was only a half-an-hour performance, but I was impressed not only by their muscles (I want those muscles! ), but also admired their choreography. It was only two of them filling up half-an-hour. One could tell they were experienced performers from the way they engaged with the audience and entertained them. There was no break within the half-hour, so they would take turns to rest while remaining in character. The physical endurance required to perform the moves the way they did showed they were very skilled and strong. As with Scandinavian summers the weather wasn’t very warm, so it’s more likely to get injured performing outdoors in those temperatures. Circus and physical theatre performers make tricks look easy, it’s easy to forget the amount of training they go through to achieve that strength. Fabiana is not a circus enthusiast as I am, but after seeing them perform she “advised” that I definitely need to build more muscles. A move similar to the “flag” on the rope but on the Chinese pole. I was also impressed with how they managed to play with different equipments in such a short amount of time. 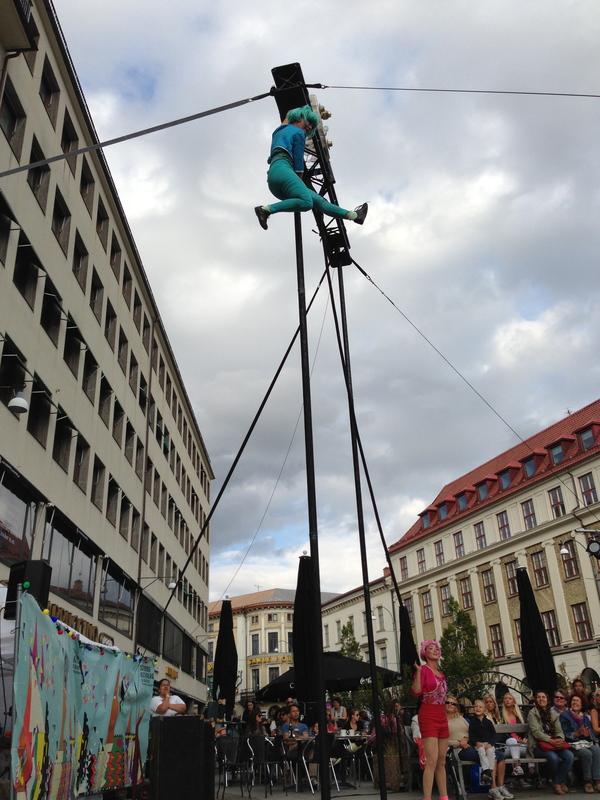 They used the pole of the free-standing rig as a Chinese pole, the cloud swing as a rope, and the platform at the top of the rig to do something similar to an ankle hang on the trapeze bar. I’m a lady… strong lady! I usually don’t take that many photos during a performance because taking photos distracts me from enjoying the moment. I think this time I clicked away to my heart’s content because it was such an unexpected nice surprise. What I feel really bad about now is I’ve actually forgotten the name of their circus troupe! The whole point of performing is to let people know who you are. I can’t believe I’ve forgotten! I know they’re Danish performers, and I thought I could google them, but haven’t found them yet. I can only remember that the name of their circus troupe is a combination of their names together starting with a B (Billie?). Posted in Aerial and tagged acrobalance, aerial, Chinese pole, circus, cloudswing, Gothenburg, Physical theatre, Sweden. Bookmark the permalink.